When a cardiac emergency strikes, finding an Automated External Defibrillator (AED) can help save a life. But that takes knowing where AEDs are located. 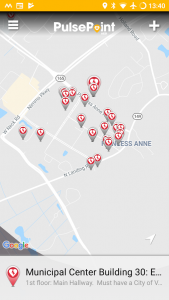 PulsePoint AED lets you report and update AED locations so that emergency responders, including nearby citizens trained in CPR and off-duty professionals such as firefighters, police officers and nurses, can find an AED close to them when a cardiac emergency occurs. With PulsePoint AED you can help strengthen the chain of survival for cardiac arrest victims. Download PulsePoint AED for free and use it to report AEDs in your community. Describe the location, snap a picture, and the information is stored for local authorities to verify. After that, the AED location data is made available to anyone using PulsePoint Respond (also available for free in the App Store). PulsePoint Respond is the app that alerts citizen responders who know CPR to local emergencies near them and also to the location of the nearest AED. The AEDs that you locate and report using PulsePoint AED are also made available to local dispatchers in the emergency communication center, allowing them to direct callers to the nearby life-saving devices. I know where there is an AED in public or in my business. How can I add this to PulsePoint? You will need to create an account. Open up the app. Make sure your location services are turned on. You should see your location on the map. You can pinch to zoom in or out. If you are by an AED, look to see if it is already located on the map. If not, hit the plus sign in the upper right corner to add a new AED. A new screen will open. On Android you will see the top part of the screen has map with a pointer. Slide the map around so the pointer is on top of where you and the AED are located. Type the name of the business or location you are at. Tap the “take a photo” icon on the lower left side. Try and get a wide shot to show the general location it is located at. Roughly 10 feet or so away works best. On Apple the map will appear to let you slide the pointer over the location. Click either Next or Save – And that is it! You photo will get sent to Virginia Beach EMS where it will be checked and uploaded into our City Wide Database. Download and mail in a paper application to the address below.